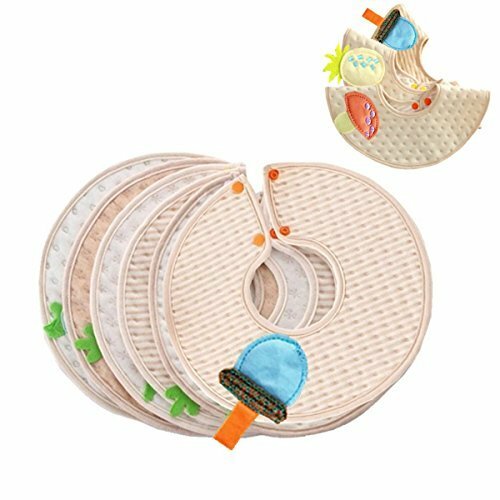 Size:Round-shape 360° Rotate 2 Size:Round-shape 360° Rotate 2 The 3-pack baby bibs set that are made out of 100% naturally colored organic cotton, the organic ultra soft fabric helps baby's clothes and body to remain dry. The organic is antibacterial that help to minimize allergy, and the fabric air permeability provides a natural comfort to baby, these bibs are come with fine workmanship and by twofold layer textile processed there is a PP cotton samdwich in the middle, and the back is waterproof fabric, super-absorbent water! so keeping your baby body in natural state, dry and comfortable, there is no eczema. 360 Degree Rotatable bibs suit active babys very much, you can rotate it when it gets too wet at one spot. Lovely and practical shape, not only is the bib also decorations. This baby gift set for 3 types of cartoon show design and you can give your baby have a fresh look and feel, also makes baby feel more happy. This is the best puzzle educational could help your baby start subconsciously learning fruits shape and distinguish between colors from infancy stage itself. This set waterproof feeding baby bandana drool bibs is the best option for you and your baby for soft touch and good air permeability, and safe, heath.. How to washing the organic colored cotton products? Clean advise - hand wash in cold water, keep dry in ventilated place. Color fade, shape and size changed might happen if dried by machine. The natural colored cotton is the outcome of natural pigment without chemical dyed, like brown, grey brown and green. It will be changed once touch acid. Therefore, it can’t be washed in acid detergent. Neutral soap and detergent should be used. and the detergent should be need to be dissolved before soaked.